It is an honor to speak at this extraordinary conference, but some tension comes with it. Rick Tarnas displayed exquisite sensitivity to this tension when he asked me if it would embarrass me to receive a fax about an astrology conference at my physics and astronomy department. No, that was not a serious problem, but I also have not trumpeted it around my department that I am speaking at an astrology conference. For many decades, I have been struggling to be true to two parts of me–the Piscean lover of depth psychology, mysticism, meditation, and astrology, and the tough-minded theoretical astrophysicist who looks skeptically on all these things. The astrophysicist is fond of his intellect, confident in the power of reason, even arrogant–a somewhat swaggering intellectual hard hat. The more mystically inclined part carries my wounds, is a more withdrawn dreamer, occasionally beset by corrosive self-doubt, but is always the doorway to the higher-a hippie visionary in a baseball hat. As you might guess, these two parts of me are often in opposition, both in the inner and outer world. For example, in 1975, well after my involvement in astrology, I was asked to sign the Bok “Objections to Astrology” manifesto along with 192 of my physics and astronomy colleagues. These colleagues wanted me to take sides in their cultural battle, not knowing of my inner struggle to get the hard hat and the hippie to dance together. The substance of our bodies comes from stellar evolution, supernova explosions, and our solar system’s formation. The sun and moon generate ocean tides. Solar storms seriously affect radio broadcasts and probably have a weak effect on the weather. We are continuously bathed in all sorts of radiation from space. Right now approximately 1010 neutrinos per second are going through each square centimeter of the top of our heads. Don’t worry. Neutrinos rarely interact with matter. It would take approximately 1010 earths lined up like pearls on a string in the path of the neutrinos to capture half of them. You won’t get a neutrino headache, but asteroids and comets crashing into the earth in the geologic past significantly affected biological history. 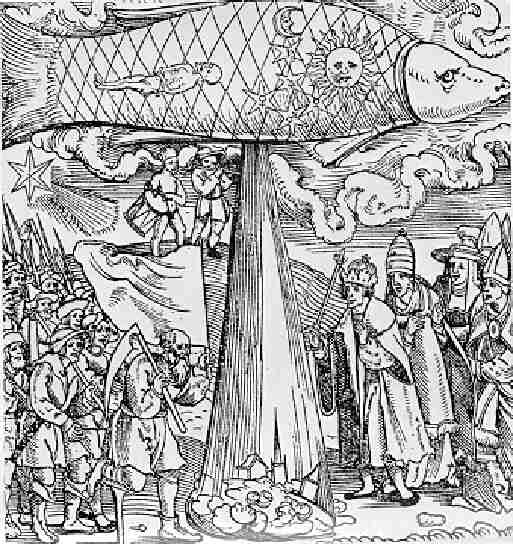 But what about astrological influence such as in the woodcut shown here from the seven-planet conjunction in Pisces in 1524? There we see a fluid influence that was believed to have caused floods and a peasant revolt. (Some even say that in an earlier incarnation, Rick Tarnas convened an astrological conference to take advantage of these powerful transits.) Today belief in such astrological influences has been replaced by ideas that can be gathered in the halls at this conference or found in the current literature. Unfortunately, the discussion of astrology, both by scientists who criticize it and those who uphold it, is extraordinarily strident, passionate, and often filled with outrageous statements. There is little dispassionate discussion of the issues and much poor scholarship on both sides. As a young man in 1975, I was enthusiastic about my latest astrophysics research but also deeply hurt by many of the scientists I admired most because of their signing such an uninformed statement against astrology. I knew they understood nothing about real astrology and its extraordinary value, nevertheless it pained me to have my scientific elders denigrate something of importance for my inner life. More than two decades later, it distresses me just as much to hear some of the astrologers I admire most at this conference bash science in an equally uninformed way. Science is hardly above criticism, but neither side is served by shadow projection. I’ll argue that the way to the personal and societal transformation we so desperately need is through reconciliation and understanding between astrology and science, not recriminations and intolerance. As we all know, in a religious war with all its primitive emotional erruptions and inability to communicate across the battle lines, truth is the first victim. The typical argument against astrology from the science side begins with the idea that there are four forces in nature: the gravitational, electromagnetic, strong and weak nuclear forces. Only two of them, gravity and electromagnetic, are long-range forces that act over macroscopic distances. Movements of free charges easily shield electric forces, and magnetic forces decrease with distance even more rapidly than gravity, thus the only force of significance for accounting for astrological influences is the gravitational force. Thus, as my late colleague, Carl Sagan, showed, the gravitational forces of the doctor and nurse are much greater than anything from the planets. So he would say don’t worry about Chiron’s position, but rather whether you had a nurse in the fifth house or a doctor in Capricorn. Such arguments are fine as they stand, but they are much too naïve. Destroying simple mechanisms for a physical explanation for astrological influence only kills straw men and does nothing to illuminate the possibility of more sophisticated ideas. Unfortunately, more sophisticated models of physical mechanism for astrological influence, such as proposed by Percy Seymour, have far too many speculative links that lack quantitative detail to allow for a reasonable judgment of their value. At this stage it is only a promise of a theory, not a full-blown quantitative physical explanation. In astrophysics, because of the nature of the work, we welcome speculative theories. They often are the starting points for major research efforts. If the proposed theories for a physical mechanism for astrological influence were not victims of a culture war, they might be considered interesting starting points for careful model building, but too undeveloped to fight over. However, given the state of the proposals with which I am familiar, within currently accepted science, there is little support for a physical mechanism for astrological influence. Saying this here makes me feel like a cop at Woodstock. Nevertheless, I encourage those interested in developing physical explanations for astrological influence to push their ideas to the limit. However, I think such causal and Cartesian explanations of astrological influence are misguided. I do not believe that astrological influence works through a physical mechanism between a planet and person. Such explanations have their roots in a Newtonian view of a world of independent objects that causally influence each other. By causal influence, I mean one well-defined thing affecting another by an exchange of energy or information, such as the sun and moon’s gravitational field causing the tides or, more psychologically, my anxiety causing my blood pressure to rise. Such causal interactions are a far cry from the acausality, nonlocality, and participatory nature of the quantum mechanical view of nature. It’s not just that the Cartesian/Newtonian view is old-fashioned and quantum mechanics is both more current and accurate in every sense of the word. Equally important, since astrology presupposes a unified view of the world, it is best understood through a quantum view of the world that has acausal interconnectedness, observer dependence, and unity at its core. Although I know of no quantum mechanical explanation for astrological influence, since the quantum worldview is so much more appropriate as a starting point for its discussion, I will very briefly summarize three of its key features. First, quantum mechanics is radically acausal. Despite its unprecedented accuracy and vast applicability, individual events do not have well-defined causes. It teaches us that lawfulness in nature does not require causality-an important lesson for astrology. Second, objects in quantum mechanics cannot always be localized in finite regions of space and time. For example, certain correlated systems of particles, that are carefully studied in the so-called Bell Inequality experiments, appear to instantaneously communicate between the parts of the correlated system. In other words, what happens in a region, say at one end of the lab, instantaneously effects what happens at the other end and vice versa. Amazingly, the correlation does not diminish with increasing distance, nor is it a causal connection. There is no energy or information exchange between the parts. Much more needs to be said about this deeply mysterious phenomenon than I can say here, but let me characterize it with the following brief statement. Nonlocality teaches that the relationship between parts is more fundamental, more real, than the isolated identity of the parts. From an astrological perspective, we could say that our relationship to the cosmos is more fundamental, more real than our isolated existence. Third, quantum objects do not have well-defined properties independent of observation. It is not simply that our observation of these very small systems disturbs them, but that they are intrinsically indeterminate prior to observation. In other words, we must participate in defining the world through our observation. Astrologically we might say that a transit is not a fully defined entity but more a potentiality for experience made actual by our participation in it. Astonishingly, this quantum view is not merely an artifact of its current mathematical formulation. Analysis and experiments, independent of the present formulation of quantum mechanics, show that nature is so deeply acausal and nonlocal that any future replacement for quantum mechanics must have nonlocal connections that work without any exchange of energy or information between the parts of the correlated system-without any causal connection. This is an extraordinary fact that should play a central role in any approach to understanding nature in general and astrology in particular. This is a long way from the Cartesian/Newtonian view at the basis of current attempts at formulating a physical mechanism for astrological influence. If you want a more substantial treatment of these ideas than I can give here, I refer you to my book. Let me conclude this discussion by saying that although quantum mechanics may not give a physical mechanism for astrological influences, we can draw inspiration from the deep unity seen in quantum mechanics, without claiming that unity accounts for the efficacy of astrology. Plotinus, the greatest Neoplatonist of the third century, long before quantum mechanics, proposed an acausal understanding of astrology in his beautiful tractate entitled “Are the Stars Causes?” There he argues that the stars are signifiers, announcers, or symbols, but not causes of our destiny. Unfortunately, this message is easily lost as the old woodcut shows. Perhaps the neutrinos are to blame. Astrologers often like to appeal to Carl Jung’s principle of synchronicity to illuminate the working of astrology. Unfortunately, the issue is clouded because the term synchronicity is used in widely differing ways. Let me briefly review Jung’s understanding of the term as a way of exploring a possibly useful acausal framework for astrology. According to Jung, synchronicity is an acausal connection of meaning between an inner psychological state such as a dream, fantasy, or feeling and an outer event. The terms acausal and meaning need amplification. Jung used causality in the conventional sense-just the way I used it above. The acausality in synchronicity rules out any causal relationship between the objective event and the subjective state-what I call horizontal acausality, since the objective and subjective elements are on the same level of known contents. He also ruled out any transcendental causes, whether it be archetypes or angels-what I call vertical acausality, since the transcendent, or what is “above,” is improperly invoked as the cause of the synchronicity “below.” In doing this, Jung was not replacing causality, but supplementing it with a new explanatory principle that is acausal in both a horizontal and vertical sense. The connecting meaning in synchronicity is not a product of the ego, but an expression of that person’s individuation, which is attempting to transform the ego. Thus, synchronicity is a dramatic expression of individuation or soul-making, or nature’s way of eliciting what we are meant to be, an authentic expression of our unique wholeness. So in this sense, meaning is a technical term for Jung. Let me embed these ideas in an anonymous first person account taken from my recent book, Synchronicity, Science, and Soul-Making. In synchronicity, as in astrology, understanding the meaning embedded in the experience is always the difficulty. To help unpack some of the meaning for this story, I’ll preface it with a short poem entitled “Crazy Jane Talks with the Bishop” by W.B. Yeats. Here Yeats has a pompous Bishop meet a wise crone who explains how Love often dismembers us before making us whole-a central theme in the synchronicity story and one that is no doubt familiar to many of us here. Not in some foul sty. and fair needs foul,” I cried. My example of synchronicity takes the form of a dream that prefigured an important occurrence in my life. About twenty years ago, when I was a year or two out of college, I was involved in a romantic relationship with a fellow student from India, whose culture fascinated me. The affair had gone on for about two years, and we had contemplated marriage but were unready to grapple with our families and their close adherence to widely differing religious and cultural traditions. In mid-December my friend revisited his family for the first time in six years, promising to see me in a few weeks. January passed slowly, yet he did not return and I heard nothing from him. On the night of February second, or early the morning of the third, a disturbing dream awakened me. This dream had two parts. The scene changed and I was lying on an operating table in the hands of evil, Nazi-style doctors. They were showing me a large flip chart of colored anatomical drawings demonstrating surgery they were planning to perform. I realized that they were going to reorganize my internal organs in bizarre ways that appeared tortuous and possibly fatal. Somehow I managed to escape. In the morning I related the dream to my close friend Jayne, who was spending the night, but neither of us had any idea what it could mean. I couldn’t imagine how a wedding on the seventh could apply to me, and so for the next five days I remained in the dark, aware only of an unsettled sense of horror evoked by the second part of the dream and wondering if anything might happen on the seventh. The following week on February 7, I received a long-awaited letter from India, addressed by a familiar hand and postmarked February 3. Inexplicably, the envelope contained a printed invitation to a wedding taking place in India on that very day. I read and reread the names of the celebrants-somehow my friend’s name was the groom on the invitation, but wasn’t it a mistake? I read the printed words repeatedly, trying to absorb the information while simultaneously rejecting it. Wasn’t it his brother whose name I was misreading, who must suddenly have decided to get married? My friend enclosed a handwritten letter, and in it explained that his trip home had been a difficult one. His family was not happy with his Americanized ways despite his success in academics and employment, and they put a great deal of pressure on him to remain at home. They were finally able instead to coerce him, using various threats, into an immediate arranged marriage with the daughter of family friends, a marriage he could in no way have anticipated before leaving for home. He pleaded for my forgiveness, promising that, of course, he would always remember me, and looked forward to seeing me when he returned to the United States with his new bride in a few weeks. I was emotionally shattered by this news and simultaneously stunned by the dream’s predictive accuracy. The dream occurred on the same date that the letter was mailed, and the date announced in the dream was both the date the letter arrived and the date of the fateful wedding. Thus, not only was I suddenly given what felt like a mortal blow, but I also was faced simultaneously with powerful and precious evidence of a mental world that somehow overrules the hard, physical reality of daily existence. Now I was forced to begin taking seriously what I had already studied in philosophy, Jungian psychology, and mysticism about the creative and projective capacity of mind. Later, my rational and skeptical friend Jayne told me how impressed she was by the dream’s predictive power and authenticity. For my part, I felt that had she not been a witness, I might have convinced myself that I must have fabricated it, no matter how vivid it seemed at the time. As the contents of the letter finally sank in I became overwhelmingly aware of the difficult road that lay ahead. I teetered unwillingly at the cusp of a paradoxical process wherein a lover was being instantaneously transformed into an ex-lover-a paradox peculiar to the realm of Eros. I could blame nobody for this painful event: my friend had only followed family obligation; his family only wanted the best for him; and his new wife was clearly innocent of any ill will. I could only look inward and wonder at the enormity of my projection, which was being so forcefully thrown back into my face. I now had an impossible task-to reabsorb somehow all that I formerly experienced as “out there” and valued in the other, without becoming a loveless being. The emotional chaos and reorganization that ensued in the following several months seemed to have been symbolized by the second part of the dream. I entered a state like that of mourning, where the world became devalued, life took on an automatic, devitalized quality, and only basic instinct kept me going. It was a lonely struggle despite the support of close friends. I felt queerly dissociated, partly identified as the subject of a trite melodrama and partly struggling to realize that there could be reason in this madness. I was also embarrassed at being the victim of circumstances for which I was in some sense responsible by virtue of my own romantic illusions. Yet the depths that I experienced suggested something further. There exists a kind of dark counter-side to the process of realizing the psyche, a side that involves a dying and decay, or alchemical nigredo necessary to the psyche’s restructuring long before we can accomplish its eventual transformation to gold. Perhaps the dream was a warning, or a way of preparing me for the event to come, although the preparation did not become conscious. Or perhaps it heightened or intensified the entire experience to come. This dream announced an important change in my psychological/spiritual life, and in case the abrupt ending of my romance was not enough to provoke the change, the dream emphasized the point. But it also provided me with a vivid sign that a higher principle must be orchestrating my experience. I was not a mere victim of chance workings in a chaotic universe, but rather there was meaning to the pain and promise of a different course intended for my life. This meaning provided a sense of direction that helped carry me beyond the emotional disorganization and depression. In this example, we can clearly see that the inner state (the dream) did not cause the outer event (the wedding in India), nor is it likely that the wedding in India caused such a detailed dream with its promise of a near fatal reorganization of her psyche. If we follow Jung, we also cannot say that the unconscious or the archetype of Eros or the Self caused the synchronicity. Instead, the acausal connection is a transcendental meaning that simultaneously embodies itself in the subjective and objective events, a meaning whose purpose is the transformation of the individual, an expression of her individuation. This example also shows the space and time transcending aspect of synchronicity, where information comes directly through the psyche rather than through conventional sensory channels. Perhaps the most profound aspect of synchronicity is that it empirically expresses the unity underlying both psyche and matter, and this may be the reason for its numinosity. In Jungian psychology there is a clear appreciation that great transformative wisdom resides in the inner world of our dreams, fantasies, and feelings. However, synchronicity shows that occasionally this wisdom, this transforming meaning, expresses itself in the inner and outer worlds simultaneously. Appreciating this re-enchants and divinizes the world. From an astrological perspective, we might say that wisdom continuously speaks to us through planetary motions. IV. Astrology and Synchronicity: Fit or Misfit? Applying the synchronicity framework to astrology, we could say that my subjective inner state correlates with the objective position of the planets. Transiting Saturn opposite my Sun does not cause my depression, but the planet’s position and my depression both express the same archetypal meaning symbolized in the traditional astrological interpretations. Although synchronicity seems to be a better framework for appreciating astrology, it is not as simple it might seem. Let me begin with two related problems: one with meaning and the other with the frequency of synchronicity. Jung stresses that meaning is the indispensable criteria for synchronicity. Without it, the inner and outer events are mere chance coincidences. Yet we claim astrology works all the time, whether we are aware of any meaning in our experience or not. In fact, we go farther and say that it works even for people who never even heard of it. Synchronicity is a sporadic and creative erruption of the unity underlying psyche and matter. Unless you are in some serious psychological or spiritual crisis, synchronicity experiences like the one above are infrequent. In contrast, astrology is effective 24 hours a day, 365.25 days a year. With or without meaning, it continually works as well for Carl Sagan as it does on you and me. The resolution of these difficulties lies in appreciating that Jung understood that synchronicity, such as the dream wedding, is a special case of what he called “general acausal orderedness.” In other words, synchronicity is a subset of the larger principle of general acausal orderedness, a principle that embodies lawful, but acausal, connections between phenomena. General acausal orderedness is the broad category shared by astrology, paranormal phenomena, quantum phenomena, and synchronicity, with synchronicity being distinguished from the rest by its association with meaning. Most people neglect this broader concept, largely because Jung said little about it and some of what he said, such as his physics examples, is actually wrong. Nevertheless, in this broader class of phenomena the meaning may not be present, but the acausal connections are still crucial. I have clarified the idea of general acausal orderedness elsewhere and used it to distinguish between parapsychological phenomena and synchronicity-something Jung did not do. These constant and reproducible acausal phenomena are distinct from the meaning-laden, but sporadic, synchronicity defined above. I suggest that when we consider astrology as working continuously without any conscious meaning, it is an expression of general acausal orderedness. Since this is a technical discussion done elsewhere, I’ll just show a summarizing diagram. Although the appeal to this broader classification of general acausal orderedness helps, there are still subtleties. Instead of a Saturn transit having a meaningful, but acausal, connection to my depression, let’s take a more interesting example. I have natal Mars in Capricorn in the first house within two degrees of the ascendant, exactly trine a two-degree Jupiter-Saturn conjunction in Taurus in the fourth house. The Sabian degree symbol for that Mars reads, “A student of nature is lecturing and conjures up dancing pictures of distant wonders before each listener.” (Sometimes that Mars wears a hard hat.) Of course, to understand that configuration in any depth, we would need to study the astrological symbols for all the involved planets, signs, aspects, and Sabian degrees, and then elicit the meaning of that synthesis-something we cannot do now. Nevertheless, on the day Rick Tarnas invited me to speak at this conference, transiting Jupiter was exactly conjunct my Mars and therefore also trine my Saturn-Jupiter conjunction. What is the outer event here-the transiting Jupiter on Mars? If that is the case then what do you do with the Tarnas phone call? Surely that too was objective. It was recorded on my voice mail. What is the inner psychological state? It is not as easy to identify as the dream image in the above story. What is the meaning? This example, although a typical piece of astrology, is neither a neat or obvious fit to the synchronicity framework. In my astrological example, it is not clear how to identify the subjective or objective elements as you do in synchronicity. Certainly, the natal chart, the transits, and the telephone call are all objective. The subjective state is neither evident nor in a clear relationship to outer events as it is in a usual synchronicity experience. Although it is not obvious, you might say that my general desire to break my intellectual isolation was the subjective state, but ego desire is an inappropriate precondition for a meaning seeking to transform the ego. In any case, it is very difficult to make these judgments now, since the experience is still playing out along with the meaning of these events. Nevertheless the fit is far from perfect. Perhaps this astrology example also has to be taken out of the synchronicity category and placed in with paranormal phenomena and quantum mechanics. However, this is unsatisfying since, unlike the paranormal and quantum mechanics, I believe that it is vitally connected to my individuation. At this stage I don’t know how to consistently interpret astrology within a synchronicity framework. As much as I am interested in acausal orderedness, it may not be an adequate framework for appreciating all the complexity of astrology. So we are left with puzzles here, but advances in understanding, whether in astronomy or astrology, rarely proceed smoothly. Perhaps the synchronicity concept needs to be modified or expanded beyond Jung’s definition. In any case, there is more work to do. Here I suggest some areas where astrology might grow so that it can more fully help soul return to the cosmos. My suggestions seek to bring astrology into the intellectual mainstream in the West. Of course, not everybody wants this, but I am trying to harmonize the hard hat and the hippie. More important than my needs, I believe that an astrology fully integrated into our modern western intellectual tradition can be a more powerful force for the transformations our culture so desperately needs. Just as James Hillman, both in his writings and his talks, repeatedly calls for psychology to move from the consulting room into the streets and political seats of power, I encourage astrology to move from its marginalized, counter-culture state of “physics-envy” into the intellectual mainstream where its much-needed ideas and values can benefit our entire culture. Astrology needs sophisticated statistical confirmation. Yes, some statistical work has been done, most obviously that by the Gauquelins, but we need much more than a few examples. To help make the point, let me briefly discuss parapsychology, which has just about as bad a reputation in intellectual circles as astrology. In the last dozen years, thanks to diligent and meticulous laboratory testing that has built upon many decades of work, there is now repeatable and robust statistical evidence for various parapsychology effects such as psychokinesis (mind affecting matter) and remote perception (knowing through non-sensory channels). I can’t discuss these results in detail, but the point is that, thanks to much careful work, even skeptical scientists admit that there is a real and repeatable effect of potentially great significance here. One of the reasons the results are so compelling is that they were obtained with the aid of diehard skeptics. Rather than disparaging the critics, or projecting the shadow on them, parapsychologists have integrated them into every level of their work to make the laboratory protocols, data collection, and mathematical analysis of the highest quality. Such meticulous laboratory studies, guided by the concerns of diehard skeptics and combined with sophisticated meta-analytic techniques, allow me to invite to my university the head of the Princeton Engineering Anomalies Research Lab-one of the most famous centers of laboratory tests of paranormal phenomena. They have no detailed explanation for the phenomena, but their experimental results can stand up to the most critical gaze of my skeptical colleagues. Perhaps astrology can be inspired by these statistical studies of paranormal phenomena. I am keenly aware that astrology, with its many subtle levels of symbolic interpretation, is more complex than just showing that through mental intention an untrained subject can bias a random number generator. However, psychological testing has improved over the years so that some of this technology can be applied to gather the appropriate data for correlations with astrological configurations. Although it is a big undertaking, requiring many teams of researchers, properly taken data and powerful statistical analyses should reveal compelling correlations. If it does not, then we have also learned something of real value, and would then have the challenge of understanding why we believe such correlations should exist. So we might follow the parapsychologists and include our critics in the design of experiments to test the correlations that we all know are there. Of course, such studies should generate new astrological knowledge, not available to the ancients. Some astrologers may worry that by calling for a significant statistical verification for astrology, I am trying to cram it into a scientific framework totally unsuited to its depth and multilevel symbolism. This is an unwarranted concern. I am only asking for a sturdy flagpole of carefully verified statistical corellations from which the exuberant, multicolored banner of astrology can wave. It is neither possible nor desirable to make astrology a branch of science. You might, however, ask, “Where would you ever get the money to finance such ambitious research programs? The National Science Foundation or NASA is certainly not interested.” The parapsychologist can inspire us here, too, for they found private money from people who believed in their cause. They have also done a lot with a little money. It is estimated that the total funding of parapsychology since the inception of the Society for Psychical Research in 1882 is less than that spent on academic psychology in two months. Now, because of that seed money, they are positioning themselves as viable applicants to the major national funding agencies. I believe a similar effort is possible in astrology. That such a simple thought experiment admits of such a wide variety of answers is just one way of showing the need for what I call “Theoretical Astrology.” I am not talking about practical astrology, how to interpret a horoscope or understand transits and progressions, but rather what are the underlying structural ideas and presuppositions inherent in astrology, its philosophic and scientific underpinning. It is not enough to say that astrology presupposes a unified worldview, one replete with acausal connections. Nor, as Project Hindsight well knows, is going back to ancient astrological texts, valuable as it is, enough to convince NASA that an astrologer should be on board the spacecraft heading for the other planetary system. If we revived Kepler, he would surely recognize modern astrology, be delighted by the elegant astrological software, Transaturnians, asteroids, etc. But he would be struck by how little has changed since his day, especially in contrast to the extraordinary explosion of knowledge in astronomy. Where are the astrological advances that compare with Kepler’s three laws of planetary motion, Galileo’s formulation of the scientific method, Newton’s mechanics, or Einstein’s general relativity? It’s probably not fair to compare the state of theoretical astrology with modern physics and astronomy, which have been so generously supported by our culture. Nevertheless, for astrology to take its rightful place in broader circles, it must have a much more secure theoretical foundation. Although we can get vital inspiration from the ancient texts, neither a Ptolemy nor a Plotinus can give us all the answers. We need a fresh and thoroughly modern formulation of the principles of theoretical astrology, one that is coherent philosophically and scientifically. Today is a golden age for astronomy. Thanks to the combination of a powerful theoretical understanding of nature combined with a vast array of sophisticated modern electronics and computing, the growth of astronomy is dazzling. I suggest that, with a coherent theory and the modern tools of psychological testing, sophisticated statistical methods, and modern computing, astrology can make a similar leap into a golden age of its own. VI. What Can Science Learn From Astrology? So far it seems like the astrophysicist is imposing his scientific values of articulate theory and careful experiment on astrology. However, I believe that science has at least as much to gain from an appreciation of astrology. Let me just conclude with one specific area in which astrology could make a significant contribution to science. In the last half a dozen years, interest in the general area of consciousness studies has exploded like a supernova. For example, about ten months ago a conference called “Tucson II: Toward a Science of Consciousness” occurred. For one week over a thousand scientists, philosophers, and psychologists gathered to share their ideas on such topics as the neural correlate of consciousness, the fundamental nature of subjective experience, how nondual mysticism can help us understand consciousness, quantum models of consciousness, and many other related topics. Although, as a physicist, I take great interest in the quantum models of consciousness, I believe they are fundamentally flawed. Such models are trying to graft subjectivity onto the individual from a science that has systematically divested itself of subjectivity since it split with astrology. In other words, since Kepler, scientists have taken a vow of objectivity, to remove all subjectivity, a central aspect of soul, from science. As beautiful and powerful as the scientific edifice is, to attempt to understand subjectivity with it in its present form is like trying to give a deaf person the experience of thunder or birdsong. Consciousness studies and science in general would be revolutionized if astrology’s central premise that subjective experience correlates with planetary positions can be established at the level of, say, parapsychology. Then mind moves from my skull to the cosmos. Perhaps with an astrology of the future, soul can even be brought into science as well as the cosmos. I’ll conclude with an experience that happened to me last night about a block from this room. There I came upon two men nearly at the point of physical violence over who had rights to panhandle at a certain corner. Most of us have grown hardened to the site of panhandlers and disheveled nests of blankets in doorways posing as bedrooms. But this pathetic squabble reminded me afresh of how obscene it is that the richest country in the world allows so many of its citizens to lose so badly in our “winner take all” economy. Perhaps if astrology can be integrated into our intellectual and cultural heritage, then the unity so evident in the cosmic dance of the planets may find an expression in a deeper appreciation of our shared responsibility for the planet and the welfare of all humanity. It is a pleasure to thank my spouse, Elaine. Her help at all levels, from the intellectual formulation of the ideas to the emotional support when I lost my way, was critical to this effort, as it is to so many others. I especially thank my late teacher, Anthony Damiani, founder of Wisdom’s Goldenrod, for introducing us to the spiritual dimensions of astrology, philosophy, and psychology from a variety of traditions and never allowing us to be satisfied with easy answers or only an intellectual understanding. Bart J. Bok and Lawrence E. Jerome, Objections to Astrology (Buffalo, NY: Prometheus Books, 1975). Percy Seymour, The Scientific Basis of Astrology (New York, St. Martin’s Press, 1992). Victor Mansfield, Synchronicity, Science, and Soul-Making, (Chicago, IL: Open Court Publishing, 1995). William Keepin takes such a position in his article “Astrology and the New Physics: Integrating Sacred and Secular Sciences, The Mountain Astrologer, August/September, 1995, p. 12. Plotinus: The Enneads, translated by Steven MacKenna (Burdett, NY: Larson Publications, 1992). Alice O. Howell, Jungian Synchronicity in Astrological Signs and Ages (Wheaton, IL: Theosophical Publishing House, 1990). Mansfield, Synchronicity, Science, and Soul-Making. William Butler Yeats, Selected Poems and Three Plays of William Butler Yeats, third edition, edt. M.L. Rosenthal (New York: Collier Books, 1986). Jung, Structure and Dynamics of the Psyche, Collected Works, Volume 8 (Princeton, NJ: Princeton University Press, 1978), p. 516. Mansfield, Synchronicity, Science, and Soul-Making, pp. 26-36. See also Mansfield, “Distinguishing Synchronicity from the Paranormal: an Essay Honoring Marie-Louise von Franz,” prepared for a volume of essays in honor of her eightieth birthday and available at http://www.lightlink.com/vic.